Beautiful chairs. I purchased the counter height chairs. I purchased because of the 360 swivel. nice feature, chairs legs can be adjusted to ensure no wobbling. Very pleased with purchase. 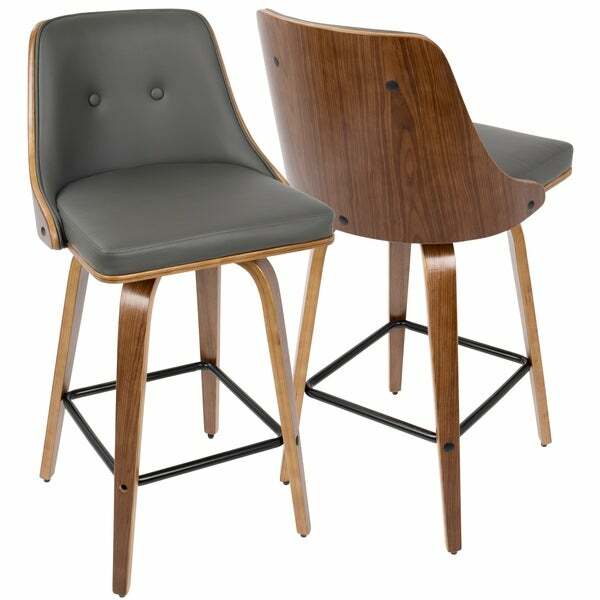 Add a touch of class and flair to your kitchen or bar area with this set of two counter stools. These stools feature a contoured wooden back, bentwood tapered legs, and dual-tufted faux leather seat. The 360-degree swivel function will allow you to move around at will. Dimensions 19.5 In. X 18.5 In. X 36.5 In. Loved the style but color is not as pictured. Purchased light gray total of 4 bar stools. It’s a bit dark. Thought they sent me dark gray instead of light gray. These are high end, super comfortable and totally fabulous!